In New York Glencore's (GLCNY) over the counter stock advanced by more than 10% in equally busy trade bringing the company's market value back to within shouting distance of $20 billion. 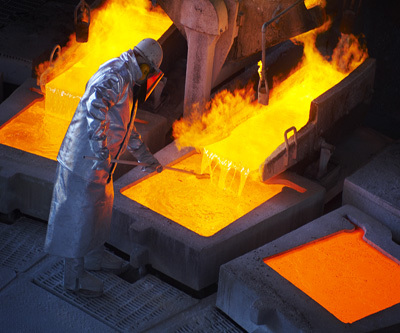 The reason behind the surge is the Swiss mining and commodities trading giant's announcement that it has increased its debt reduction target and cut spending plans. Again. That these type of corporate initiatives (which are now a common feature of the industry) can inspire such a frenzy is a good indication of just how much turmoil and uncertainty there are in the mining sector. Glencore CEO Ivan Glasenberg also announced its capital expenditure for 2015 will come in at $5.7 billion, $300 million below previous targets while next year's outlays will be cut to $3.8 billion from $5 billion. Glencore was first floated in May 2011 and two years later the company acquired coal giant Xstrata, turning it into the world's fourth largest miner. Down 70% just this year despite today's bump, Glencore is now worth $15 billion less than before the Xstrata takeover. Image supplied by Glencore show Anibal Contreras clearing slag at the company's Altonorte metallurgical facility, northern Chile.